A rare Old World gull showed up at Moraine State Park on Friday so a lot of birders made the trip to see him last weekend. I was one of them. Black-headed gulls are native to Europe and Asia though a small population crosses the North Atlantic to spend the winter in the Canadian Maritimes. They are rare in the northeastern U.S. and extremely rare west of the Appalachians, so of course this bird attracted a lot of attention. He was not a Life Bird for me but far more satisfying than the first one I saw at the exact same spot in December 1998. Back then I was disappointed. I was so new to identifying gulls that I knew I’d never be able to recognize him again without help. He looked like a Bonaparte’s gull. Just like a Bonaparte’s his head is not black in winter. It’s only dark during the breeding season and then it’s not really black, it’s chocolate brown. (Here’s what he looks like with a chocolate brown head.) So much for his name. 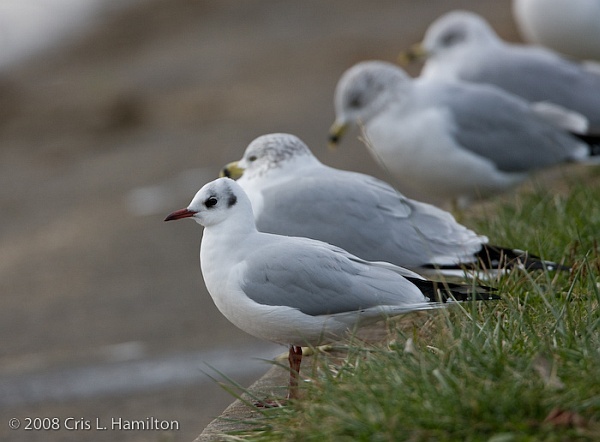 The big difference between the two is that the black-headed gull has a red beak and red legs. 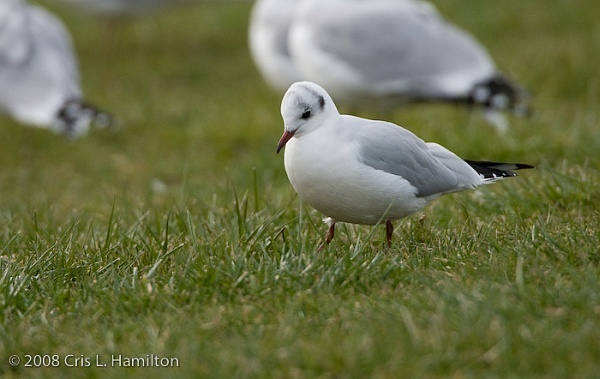 You can see these features easily in Cris Hamilton’s photos of a black-headed gull at (yes!) the exact same location in December 2008. You can also see two faint lines that reach over his head from eye to eye and from ear to ear. Someone remarked yesterday that the lines looked like he was wearing a set of headphones. Black-headed gulls are halfway in size between Bonaparte’s and ring-billed gulls, the two North American species they typically hang out with. Though they look like Bonaparte’s gulls their lifestyle is most similar to the ring-billed. This puts them in an odd situation. Should they associate with lifestyle cohorts or try to blend in? This one chose to hang out with those who could help him find food. Yesterday the ring-billed gulls chased him occasionally but otherwise rested peacefully, so he’s probably made a wise choice. He’ll find a lot of food and make it through the winter. I wonder if he’ll return next year. I was hoping to see a black-headed (or little gull) on my oceanside walks this wknd at the Jersey Shore. No luck. Alas, my target bird was cavorting elsewhere. Cool find at the shore. Way cool find inland. ps…I’d rather try to identify this bird as it’s ambling around on some grass or standing on a curb vs. flying around with a zillion other gulls. I heard about this on the PA list, but it’s way to far for me. It stinks being a birder who can’t drive 🙁 . A lone black-headed gull has recently been seen at Hunt Valley Mall, north of Baltimore, MD, on numerous occasions.